Senator Ben Nelson is Chairman of Nelson Taplin Goldwater, a regulatory and government affairs firm and Of Counsel at one of Nebraska’s most prominent law firms, Lamson Dugan & Murray LLP. Previously, Senator Nelson served as Chief Executive Officer of the National Association of Insurance Commissioners (NAIC) from 2013-2016. He was selected based on his unique combination of executive, legislative, and regulatory experience. From 2001-2013, Senator Nelson served two terms representing the State of Nebraska in the United States Senate. Earlier in his career, Senator Nelson was Governor of Nebraska. In 1994, he became the first Nebraska Governor to be elected to a second term in two decades. Senator Nelson earned his bachelor’s degree in 1963, a master’s degree in 1965 and a law degree in 1970, all from the University of Nebraska. 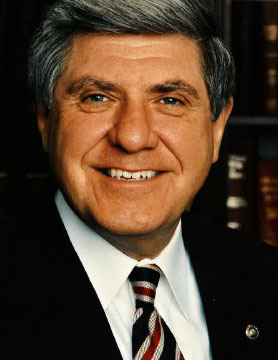 Nelson also received the 2011 Distinguished Alumni Award from the University of Nebraska College of Law and an honorary Doctor of Letters from the University of Nebraska in 2013. In addition, he has honorary doctor degrees from Creighton University, Peru State College, College of St. Mary and Midland College. Senator Nelson and his wife, former first lady Diane Nelson, have four children and five grandchildren.